The process of purchasing a home presents several challenges including, selecting a home type. Two major options available include the mobile and modular homes. 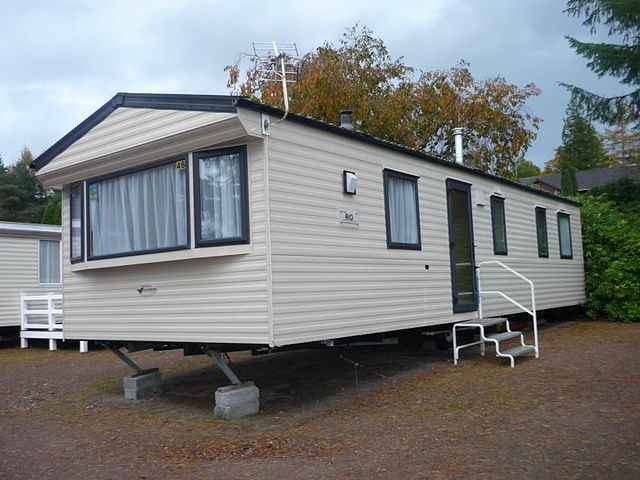 Mobile homes are those that are referred to as trailers, are smaller and fully equipped with pairs of wheels. The very first mobile homes can be traced to 1976 during the enforcement of the National Mobile Homes Construction and Safety Act in the US. Modular homes are those that conform to the on-site building codes, either locally or regionally. The modular homes are much more sturdier due to the rigorous standards that have to be met. Both types of homes are manufactured in factories and not constructed on the site. Today impressive and innovative eco-friendly mobile and modular homes are available in the market. The purchase process of the two designs is also quite fast, enabling individuals to become homeowners within days. A mobile home is also referred to a trailer. These types of homes are small, fully equipped with all the home requirements and are set on wheels that allow mobility. They were first officially approved and released in the market in the 1970’s and it is only within the 1990’s that the designs and innovativeness were incorporated in the designs. During the World War II, these homes gained in popularity as a temporary solution for workers who needed to often travel for war purposes. Once the war ended, affordable housing was scarce and in high demand by veterans who were returning to the US. Due to increase in demand within the 60’s their supply significantly increased. In 1974, the US Congress passed the act that would guide the manufacturing of these affordable housing options, documented under the HUD Code regulations. Mobile homes are also referred to as manufactured homes. Modular homes are a great example of factory-built housing. These houses are those which are built according to the same standards as the on-site homes but with less time and energy. Modular homes reduce the construction period by up to 50% as compared to on-site structures. Factories manufactures the different structures needed to complete a home, which will later be transported to the site of construction. With the use of cranes and expertise the structures are then put together into a home. Once complete a code inspector must assess the house to ensure it meets the standards and building codes of the region. Most of modular houses have similar structures, colors and finish due to mass production. Mobile houses are built on wheels which makes them portable. On the other hand, modular homes are permanent they can’t be easily moved once the structure is set up. Mobile homes such as trailers are purchased as a fully equipped mobile home that does not need any form of construction. Modular homes are made in factories but require some form of construction as the structures are being set up into a home. The mobile and modular homes are regulated by different boards and acts in the US. The mobile homes are regulated by the National Mobile Homes Construction and Safety Act. Modular homes must meet the standards set for on-site constructed houses. The foundation of mobile homes is a steel chassis with wheels. The foundation of a modular house is often cement. Modular houses are generally much larger than mobile space. They can be as big as one may want them to be as they come in different sizes. This means they also occupy more ground space. Modular homes have a longer set-up time when compared to mobile homes. This is because of the construction process involved. Mobile homes have no build time as they are delivered ready-made. Mobile homes can only be one story. Modular homes can be of up to three story’s. Modular homes are more expensive than mobile homes. Mobile and modular homes are both considered cost-effective affordable housing options. Mobile homes started way back in the World War II. They were later authorized in 1976. The National Mobile homes Construction and Safety Act regulates the construction of these homes. Modular homes are factory-build houses that are later assembled on the construction site. Modular homes are initially a bunch of different structures that have to be transported and assembled by cranes. Modular homes must meet the standards of the on-site constructions within a given region. Modular homes are much larger in size when compared to mobile homes. The foundation of mobile homes is steel chassis on wheels while that of modular homes is cement. Modular homes are not portable once assembles on a site unlike mobile homes which can be moved anywhere. Evah Kungu. 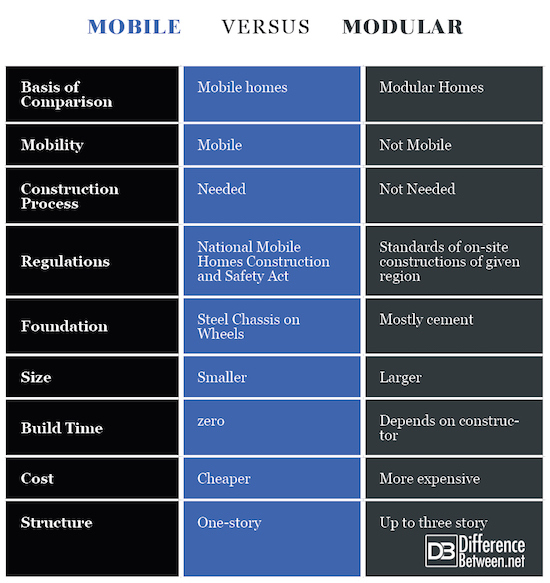 "Difference Between Mobile and Modular Homes." DifferenceBetween.net. July 23, 2018 < http://www.differencebetween.net/language/words-language/difference-between-mobile-and-modular-homes/ >. Tanney, Joseph, and Robert Luntz. 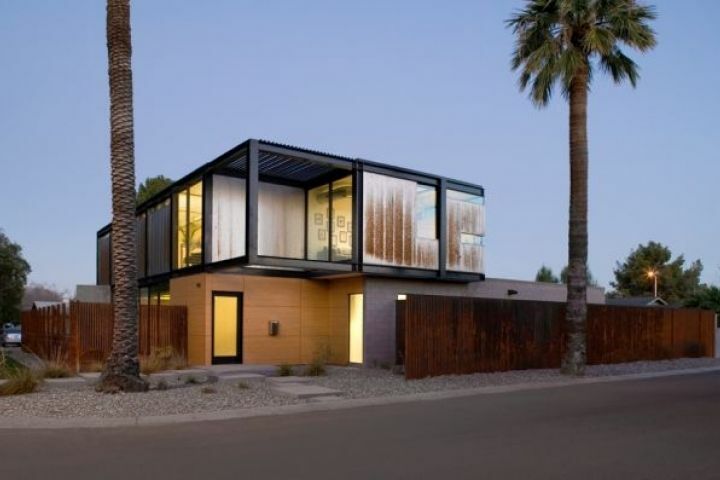 Modern Modular: The Prefab Houses of Resolution: 4 Architecture. Princeton Architectural Press, 2013. Ford, James, and Katherine Morrow Ford. Classic Modern Homes of the Thirties: 64 Designs by Neutra, Gropius, Breuer, Stone, and Others. Courier Corporation, 1940. Smith, Ryan E. Prefab Architecture: A Guide to Modular Design and Construction. John Wiley & Sons, 2011.